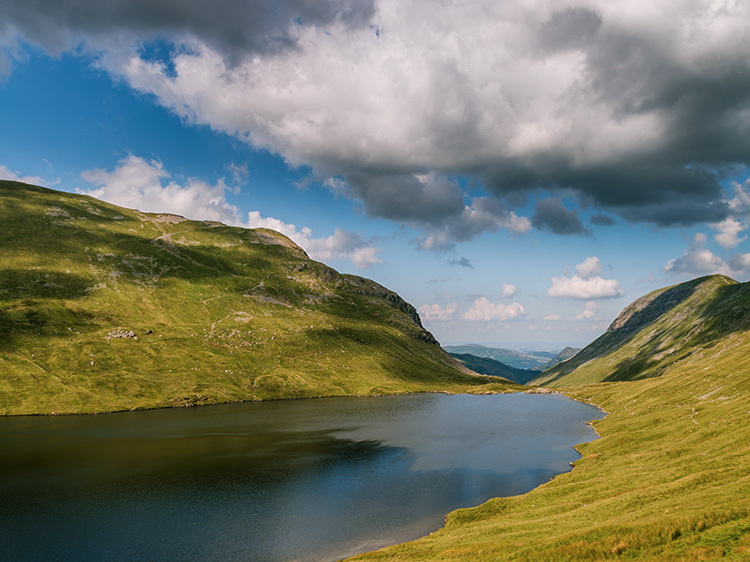 Summary: This walk involves a steady climb from Mill Bridge on the A591 to Grisedale Tarn and then follows a steep push up to the summit of Fairfield. 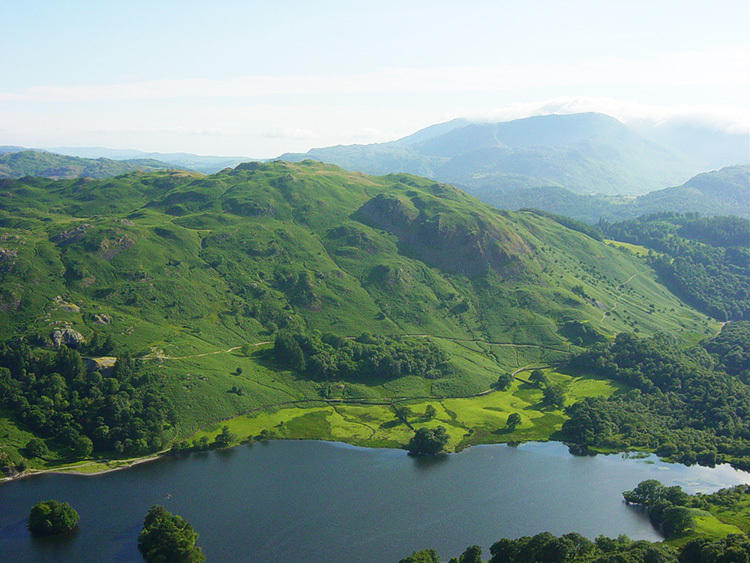 From the mountain top it is a gentle walk at height to Great Rigg and Heron Point enjoying beautiful views all around until descending to the outskirts of Rydal. 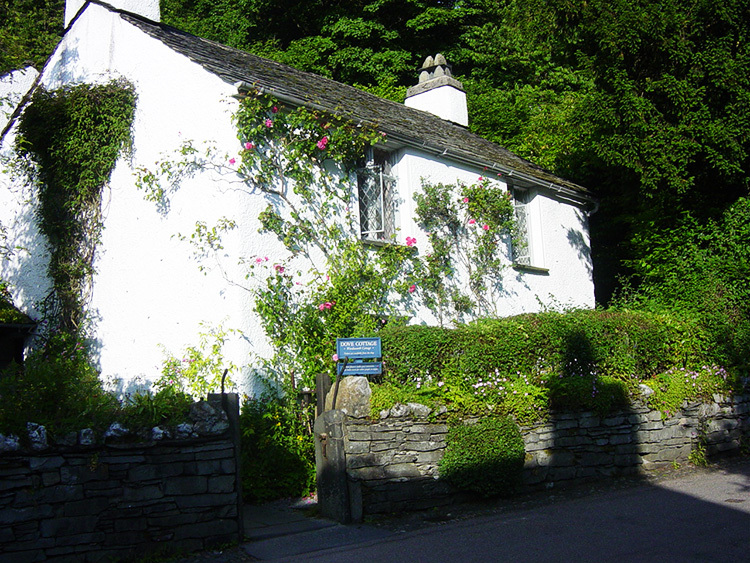 Then the route follows a bridleway to Town End before another steep climb to Grey Crag and Butter Crag before descending once more and conclding with an amble back the Travellers Rest pub. You could call in at the pub for a well earned beverage. You will have deserved it. Living in East Yorkshire had not inspired me to do lots of walking on a regular basis and even though I had walked the Wolds Way and Dales Way long distance footpaths earlier in the year I had not kept myself very active isince then and it showed. I was absolutely knackered as we climbed from our start point at the popular Mill Bridge lay-by up Great Tongue to Hause Gap and Grisedale Tarn. I was so poor it was embarrassing but I kept going and by the time we reached Grisedale Tarn I was feeling a little better. Thank heavens we had a short breather beside the tarn as it looked a difficult climb from the waterside up Fairfield Brow. And it was a good job Deke was not in a hurry in climbing to the summit either because as Dave and Ally drove themselves at pace up the steep ascent of Fairfield Deke and I ambled steadily up behind them. The workout paid dividends though as I shook off my initial lethargy and was finding form as we reached the top of Fairfield. It was time to enjoy the tremendous views from the summit as there was such a lot to feast eyes on from Morecambe Bay and the Solway Firth in the west to the array of Lakeland peaks all around. 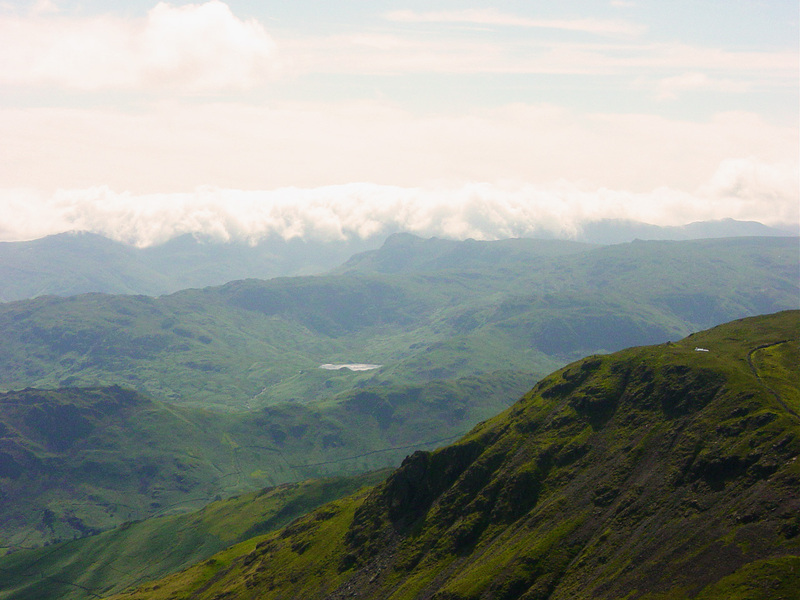 It is a great place on top of Fairfield so take in the views while you are here, stay a while. 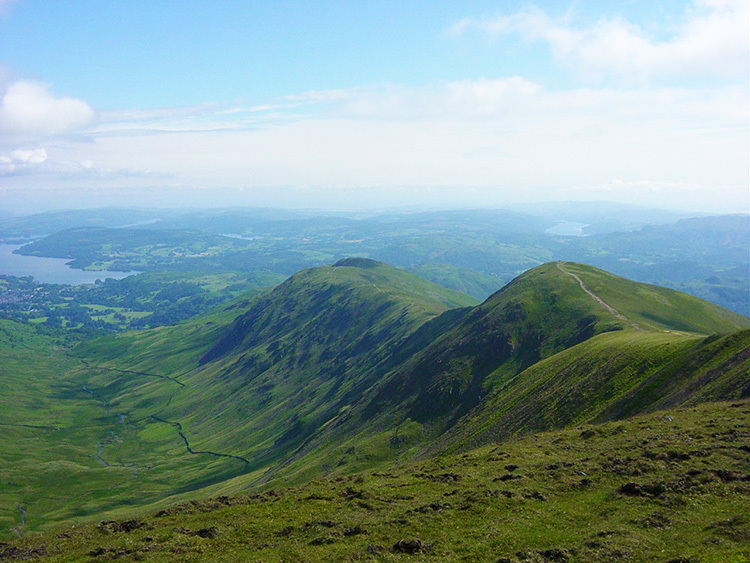 The walk from Fairfield to Great Rigg is superb. 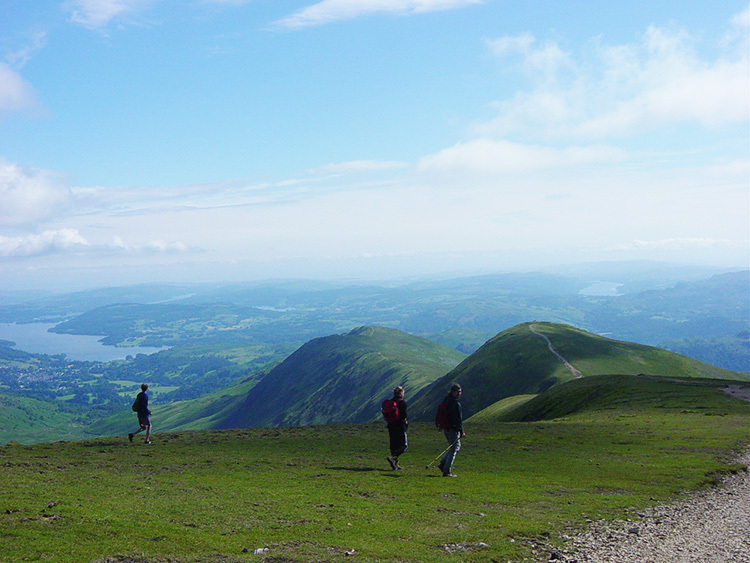 The ground is lovely and springy underfoot without giving way and the views are spectacular as Lake Windermere comes into your view by looking to your left. While we were here, in glorious sunshine there was also a line of cloud clinging to the tops of the south western fells, a ribbon of cloud that never seemed to move all the time we were up on the fell tops, and yet we remained in unbroken sunshine, topping up the tans on our weathered brows! 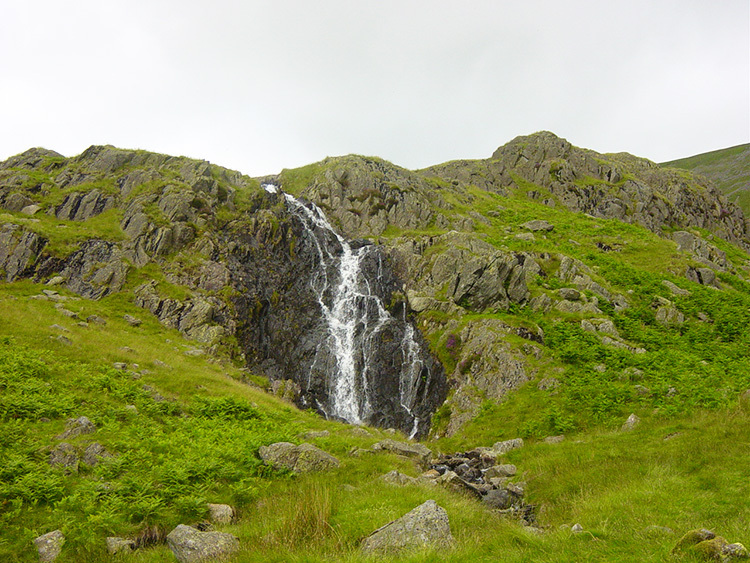 The descent from Fairfield via Great Rigg to Heron Pike is gradual resulting in a lovely descent and it is only as you begin to drop off Heron Pike with Rydal Water coming into view that the descent becomes harder. Nab Scar is a pain, short but steep where you need to apply the brakes fully. 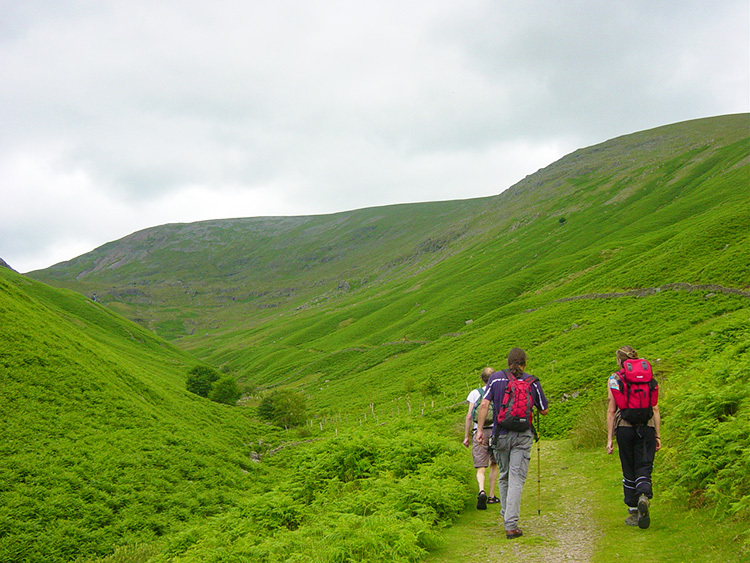 Once down the walk takes you undulating along a bridleway from Hart Head Farm to Town End before embarking on another steep climb To Grey Crag and Butter Crag. There follows a second steep descent of the walk to a side road which leads back to the A591. All that remains is a short walk along the main road back to the starting point, a small price to pay for such an exhilarating walk. We stopped of at the Travellers Rest pub for a very much needed drink.